As we offer people more powerful controls, we’ll also begin showing ads on Facebook desktop for people who currently use ad blocking software. This one sentence was buried in an announcement about increased controls regarding the ads you see. If you aren’t aware, software like Adblock Plus has been created for users who hate Facebook ads so much that they add a plugin to hide ads from their news feed experience. This certainly cuts into Facebook’s revenues, but it also impacts the advertisers who leverage its audience to drive their business. Within two days, Adblock Plus came up with a workaround — though an ineffective one — and Facebook immediately addressed it. Expect this to be a cat-and-mouse game between companies like Adblock Plus and Facebook, but one in which Facebook is the cat. How does this impact advertisers? 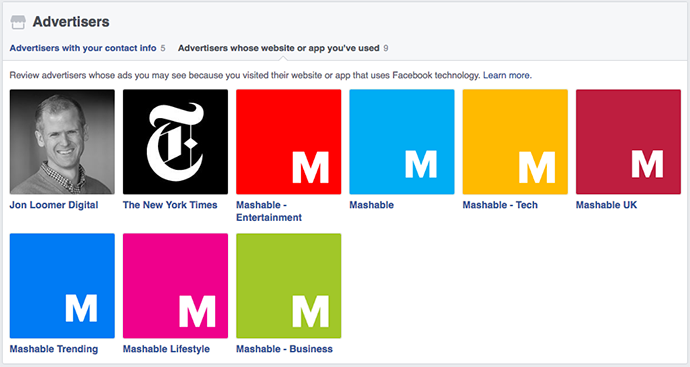 Well, if Facebook succeeds, it means increasing distribution on desktop placements. With increased distribution and inventory, costs may drop. 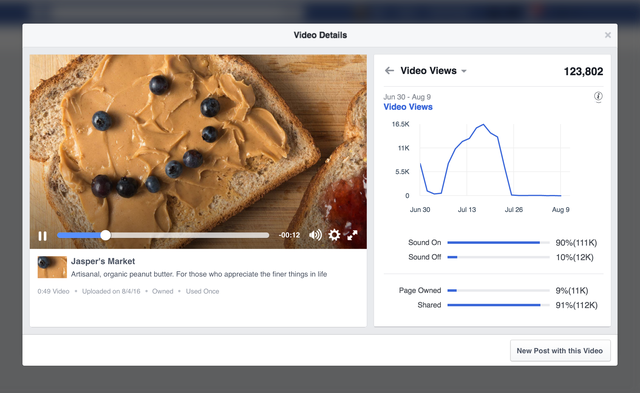 As part of that same announcement, Facebook also officially announced improved controls over the ads you see. This is actually something that members within my Power Hitters Club spotted a few months ago, but it now appears to be fully rolled out. 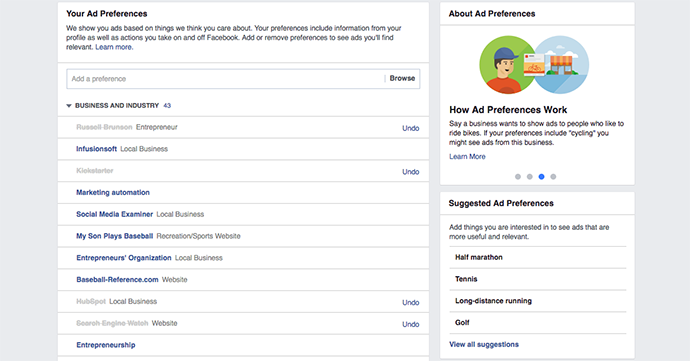 You can now view what interests advertisers can use to target you with ads via your ad preferences. You can remove or add interests to improve the relevance of ads you see. While in response to ad blocker software, this does not mean users can completely opt out of ads. It just means they have more control over the types of ads they see. If you remove all interests, the ads will simply be poorly targeted. These ad preferences were an eye opener to me, uncovering just how inexact interest targeting can be. I cleaned out my ad preferences back in June because there were so many out-dated or completely irrelevant interests assigned to me. I checked again yesterday, and it may have been even worse. I probably removed 95% of the interests associated with my profile. Granted, I may not be the typical Facebook user. I often visit Facebook pages as part of my one-on-one service. That may throw Facebook off a bit. But then again, this goes back to a basic understanding that simply because you clicked on something doesn’t mean you’re interested in it. For example, I’ve clicked on many articles for the opposing political party — but not because I support that candidate. And yet, Facebook gives me interests as if that’s how my politics align. Something to consider when you run ads. Use interests if you have no other options, but when in doubt target those who are most closely connected to you. You can easily remove any of these advertisers so that they can no longer reach you with ads. While I certainly don’t want people to opt-out of remarketing, I’m not all that concerned about this control becoming popular. Users have proven for years that when given the option — particularly a buried option — to control things, they don’t take advantage of it. If you chase the Facebook news feed algorithm — you shouldn’t — you’re having a busy week. This isn’t the first time Facebook addressed click bait. About a year ago, Facebook implemented changes to the news feed algorithm that were intended to punish click bait. Posts were flagged when someone clicked on a link but returned quickly to Facebook. If this was a common reaction, Facebook would show it less frequently. While I do believe click bait is down, some still breaks through. Clearly, Facebook still sees it as a problem. Hence, yet another — more sophisticated — attempt to eliminate click bait. …(1) if the headline withholds information required to understand what the content of the article is; and (2) if the headline exaggerates the article to create misleading expectations for the reader. For example, the headline “You’ll Never Believe Who Tripped and Fell on the Red Carpet…” withholds information required to understand the article (What happened? Who Tripped?) The headline “Apples Are Actually Bad For You? !” misleads the reader (apples are only bad for you if you eat too many every day). If you own a website that consistently uses click bait headlines, all shared links to your domain will get lower priority in the news feed. Similarly, if your page regularly shares click bait links — even if they aren’t from your website — your page’s posts will be punished. The two keys here are “withholding” and “misleading” information in the headline that inspires users to click. I can tell you that I already make it standard practice to avoid creating click bait headlines. In fact, I refuse to share an article with a click bait headline, even if the article itself has value. If you currently engage in click bait, stop. While you may be punished initially, Facebook indicates that those who change their ways can recover. Another update. Your news feed will now favor stories that are “personally informative,” as determined by your own signals. That could be anything from recipes, to local issues, to global current events. The stories people rate as informative and really informative help create a new prediction about how informative we think you’ll find each story. What is your relationship with the person or page that posted it? What do you click on? It’s possible that this adjustment will bring back some of the reach and engagement that news and media companies lost during other news feed changes. 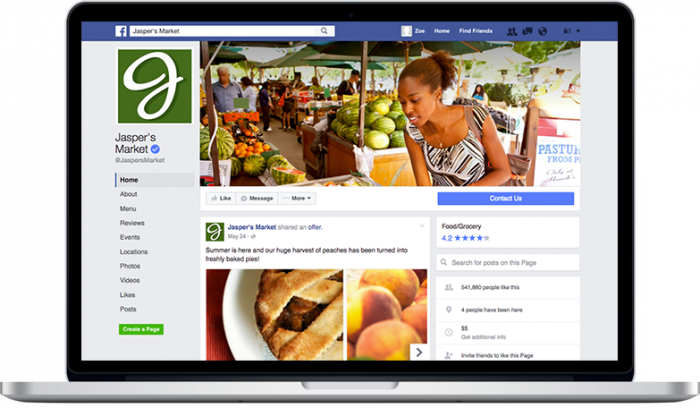 After testing changes to the page layout for months, Facebook has made an official update. Your profile photo no longer overlaps with your cover photo. So if you’ve been doing something creative that integrates the two, just a heads up. Your profile photo is now positioned by itself at the top left of the page. Facebook says that the cover photo dimensions remain the same (828px x 315px) with the profile photo displaying a square 160px x 160px. The page name and username are now displayed under the profile photo on the left instead of being an overlay on top of the cover photo. If you’re using a call-to-action button, it’s now bigger, brighter and more prominent. Your CTA will appear as a large blue button on the right hand side of the page. In general, this design is much cleaner. Other items that were previously on the left side are now on the right. Facebook has also removed ads from the right side of pages (they still exist on the right side across other real estate on Facebook). 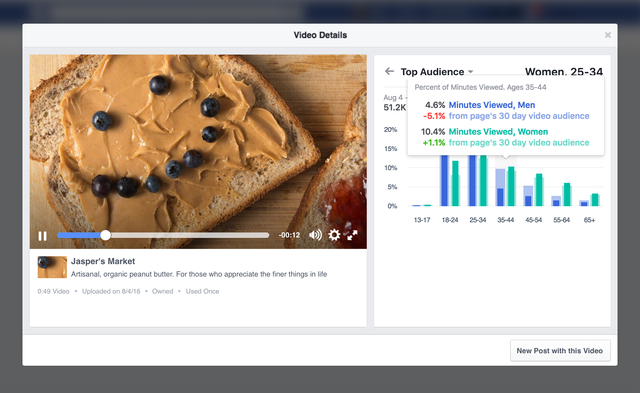 Facebook has rolled out several new metrics to help publishers measure the impact of their videos. In each case, publishers can compare demographic engagement of a video to that of the typical video posted by that page. 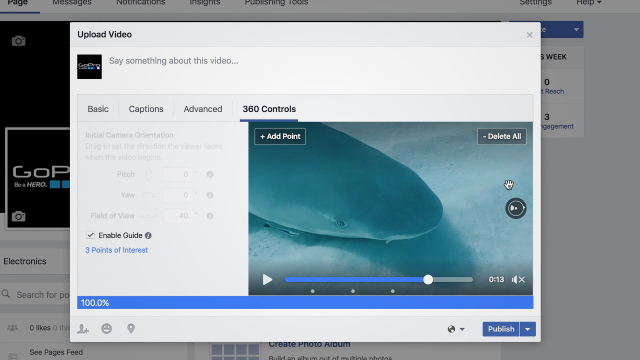 If you record 360 videos, Facebook is offering you more tools for your toolbox. One issue with 360 video is that you can look at anything within 360 degrees. What should the user be looking at? Guide allows 360 video publishers to select points of interest so that when a user views the video it automatically pans to those points. Guide opens by default, but it can be turned off at any time, allowing the user the freedom to pan wherever they’d like. What are users looking at? Heatmap shows publishers what viewers are most and least likely to be looking at during each portion of the video. 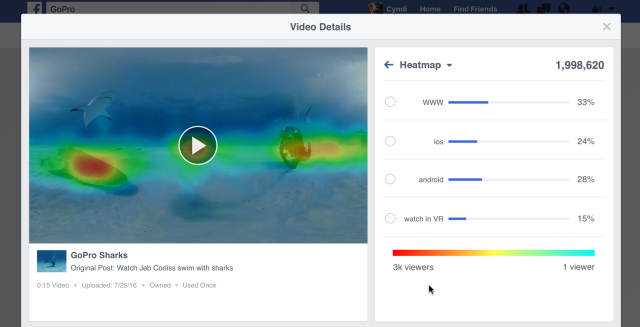 Heatmap will be available for videos posted beginning May 1 that have more than 50,000 unique viewers. This is a development I’m most excited about. Publishers can now create audiences of people who are most active on their websites. Download Links in Power Editor and Ads Manager: One complaint from advertisers is that they don’t know where to find the leads once lead ads are running. 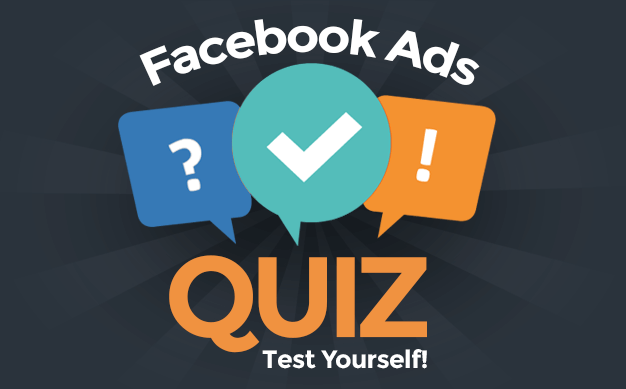 They are otherwise buried within the Facebook page publisher tools. 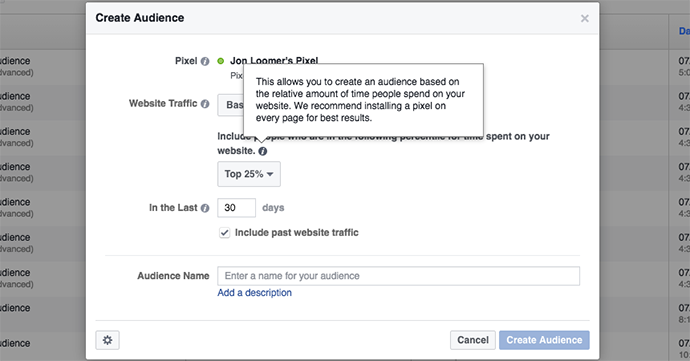 Lead Ad Custom Audiences Generated Automatically: Facebook recently rolled out Lead Ad Custom Audiences. These are fantastic, allowing advertisers to create audiences of people who have opened, opened and submitted or opened and didn’t submit a form. But now these audiences will be generated automatically. Scrollable Forms: Originally, a user engaging with a Lead Ad form would need to click multiple times prior to submitting. 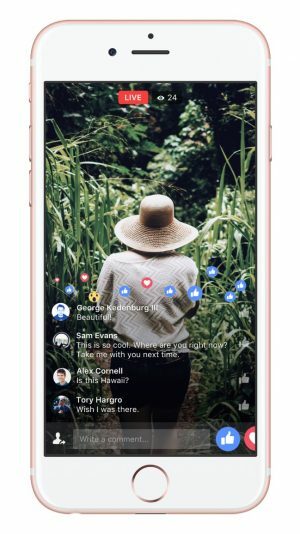 But now Facebook is rolling out a scrollable form that they say results in an improved user experience and higher conversion rate. 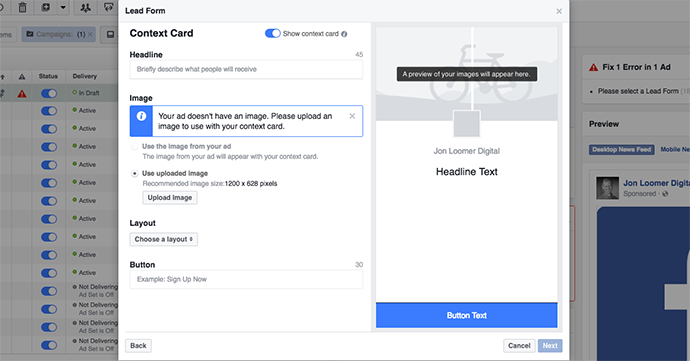 Context Card Custom Image: Lead Ads work great because they are so easy for the user, automatically populating information like name and email address from their Facebook profile. But it’s possible they can be too easy, resulting in low quality leads. That’s why context cards may be necessary, giving users an additional step and more information about what they are registering for. 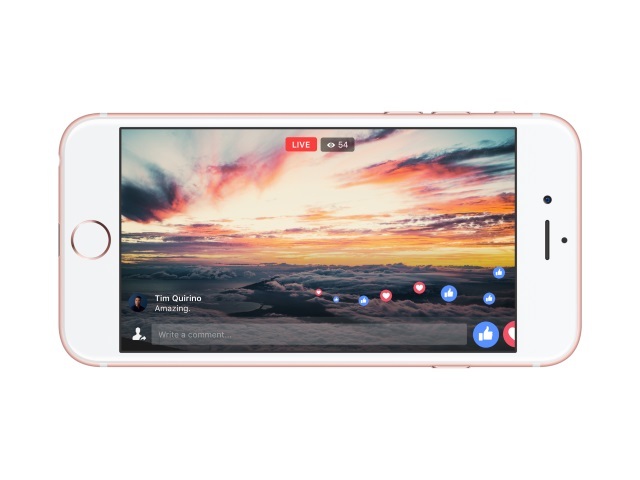 Facebook continues to make updates and improvements to Facebook Live. 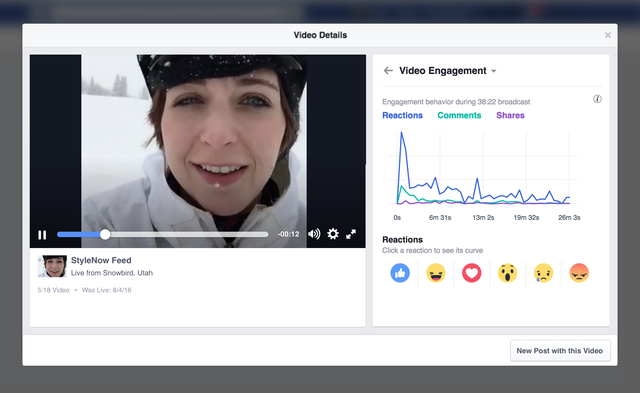 Previously, live video appeared above reactions. Now live video goes full screen for both landscape and portrait views. Reactions now overlay on top. Both broadcasters and viewers can temporarily hide reactions and comments to focus only on the video by swiping right. They can bring those reactions and comments back by swiping left. Facebook Live sessions can now run up to four hours! We’ve known for quite some time now that Facebook would move completely to the new pixel. There is now a timeline for when the old conversion pixel will go away. July 15, 2016: New ad accounts will not be able to create conversion tracking pixels. This includes existing accounts that have never created a conversion tracking pixel. September 15, 2016: All ad accounts will no longer be able to create conversion tracking pixels. Previously-created conversion tracking pixels will still be available for use in campaigns and reporting. October 15, 2016: Facebook will no longer actively support the conversion tracking pixel. At this time, Facebook will no longer be adding functionality or actively maintaining the conversion tracking pixel. They will still be available for use in campaigns and reporting. February 15, 2017: Conversion tracking pixel will be disabled. At this time, the conversion tracking pixel will be disabled and removed from our advertising tools. Results from campaigns that used the conversion tracking pixel will still be viewable in your reports. If you hadn’t yet moved to the new Facebook pixel, you need to do so. Use a combination of Custom Conversions, Standard Events and Website Custom Audiences. There is no longer any need for the old conversion pixel. Not all of these updates are available to everyone yet. But they’re coming soon!